Aiming to reach the “next billion” users of their service, Google pioneers an experimental project where users can enjoy Internet for free using their mobile phones. In partnership with Globe Telecom, Google introduced Free Zone in the Philippines as the first country to deploy such service. This is Google’s way of expanding their service to those in the developing markets. Philippines is just the first. Soon, Free Zone will be available in other territories. This Google Free Zone enables Filipinos to access Gmail, Google+ and Google Search for free by accessing a special domain, g.co/freezone. Provided that the user only accessed all those listed Google services, they won’t get charged. Visiting other sites, however, will prompt a pop up message informing the customer that he will be charged for succeeding connections. 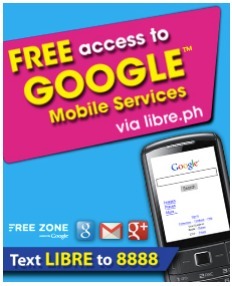 To access Google services on your mobile phone free of data charges, simply text LIBRE to 8888 for free or visit http://libre.ph on the phone’s default browser. Those without Google accounts can sign up for free and create one by following the “Create an Account Now” link on their mobile phones. For more information about Free Zone, visit Globe Free Zone info page. This experimental project is not an original concept. Facebook has a similar service called Facebook Zero wherein subscribers can access the social network giant for free via the domain 0.facebook.com.